Assessment costs continue to be a significant portion of medical and rehabilitation expenses following the 2010 reforms. Those reforms introduced a $2,000 per assessment cap on both insurer examinations and assessments conducted by healthcare providers. As well, provider assessments now fall under the overall medical and rehabilitation cap. Based on data from the General Insurance Statistical Agency (GISA), the total cost of all assessments in 2010 was approximately $ 1 billion. In 2010, assessments represented approximately 40% of all medical and rehabilitation expenses. The chart below sets out insurer exams and provider assessments per accident half year as a percentage of all medical and rehabilitation expenses using available HCAI data. 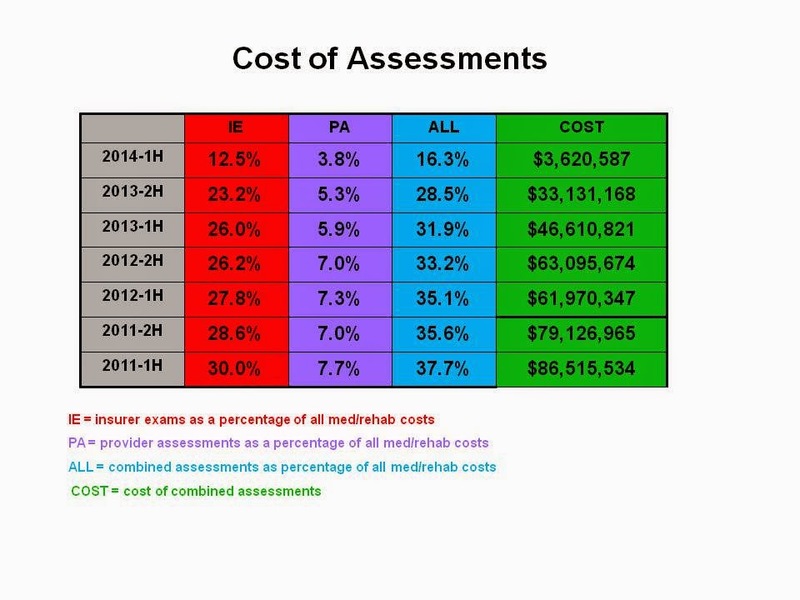 Note that the cost of assessment is not really falling as suggested by the chart. The data is not fully developed and since assessments continue to be a significant cost in older claims, the numbers will continue to grow over time. What is significant is that assessments continue to be close to 40% of all medical and rehabilitation expenses once the data is fully developed. What has changed is the cost of medical and rehabilitation under the SABS with the reduction in the standard medical and rehabilitation cap and the introduction of the minor injury treatment cap.